Ever since from as young as I could remember, I had been helping my mother to bake jam tarts. It is an annual thing before Chinese New Year. 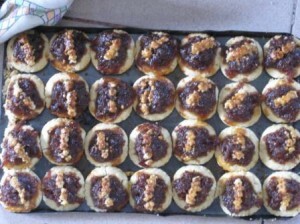 The jam tarts would be then distributed to neighbors, relatives and friends… FOR FREE. We get to take some back to share with our friends. The baking thing lasts almost the entire day- but as we, the kids grow up, we got faster and more efficient in our work so the baking could finish early. If you look at the picture above, the tarts are not beautiful or impressive. In fact, one of my mom’s friend, who loves jam tarts once arranged about 5 different jam tarts that she had gotten from various places- some are bought and quite costly. She asked a friend to taste and identify the most delicious jam tart. Her friend, after tasting all, pointed at my mom’s jam tart and said, “the ugly jam tart is the most delicious one”. As I mentioned earlier, for many years I could not understand why she had to put in so much of effort to bake all these stuff. Most people I know would just pay money to buy various cookies- much easier. And if one would like to bake, it is often the butter or peanut cookies. Or with the fried ngah ku (made from fried arrowhead). Even on the year when my mom was unwell (recovering from her illness) she also made the jam tarts- and as children we had to make time from our busy schedule to help out. Why, why must be something so labor intensive? Recently, it has dawned on to me on the true meaning of the labor of love. Yes, our jam tarts are not beautiful looking because we focused a lot on the ingredients and quality- and we do not have the time nor the expertise to beautify the tarts as the more we can make, the more people can we distribute to. But somehow, people who ate usually commented that the tarts are very delicious- it’s not only the ingredient but it is made with the labor of love. People feel and sense it. It need not be expensive and cause a huge hole in budget. My mom have true friends- I remember when my mom was recovering in hospital years ago, so many people came to visit her and her bed was filled with so much of flowers and hampers that there was not enough place to put them. Concerned friends, including my own friends (who ate a number of her cooking) took time to visit her in the hospital. Values such as these must have been impressed in my subsconscious gradually over the years. To give and to give sincerely from the heart. To do our best to give something else to others- as a gift of love. It need not be expensive, or very beautiful but something that others would appreciate. Something that even with money is hard to buy. It is given even though there may not be something in return- so long as her friends appreciate and want to eat the tarts. Cooking and baking have never been my forte. I prefer writing, communicating and running my blogs during my available time. I write many articles from the heart- many of the articles came from my personal experience and understanding. Sometimes I get emails from those who thanked me, and sometimes, there are those who critisize. But after running blogs for a few years, I’ve learned not to take negative comments personally- after all, what suits me may not suit others- example on mind-body related issues, I’ve always lay out my point of view but ask the readers to consider themselves to see if it suits them or not. We may find that sometimes in a difficult situation- we would need to accept that we cannot change the situation, but we can do whatever that is within our skills and abilities to make things easier. When it is done from the heart, it requires less effort- as it sometimes seemed to flow effortlessly. If we do anything and always have some kind of hidden agenda or expectation of something in return, then when we do not see immediate results, we would feel upset and tired. Think about it- you may take extra pains to help people during work, putting in good quality work. Perhaps your work may not be appreciated and some may even fault find your work. But it does not matter if you can tell yourself honestly that you have done and given your best. Because if in your heart you want to give your best, you would take the time and trouble to learn things even though you are not paid for it. These things would become your skills that you can take with you wherever you go. Perhaps the company now may not appreciate you for it- but one day, you would find a company that would appreciate you. Over so many years of working, I’ve seen companies letting a good staff go- and the staff went on to earn big bucks from another company. It’s the company’s loss for not being able to retain its talent- not the staff.